On May 28th, a Liming international trade representatives attended the “Peru infrastructure and public services consultation”. The minister chancellor of Peruvian embassy, the executive director of foreign trade top 500 companies club, more than twenty executives attend the meeting. Because of the outstanding contributions in the international market, Liming Heavy Industry was absorbed into the foreign trade top 500 companies club. During the meeting, the minister chancellor of Peruvian embassy issued the membership certificate for Liming Heavy Industry. Accompanying the increasing of the overseas projects of central enterprise, the partnership with Liming is more and more close. For example, the 200tph mobile crushing production line for Qatar highway project, the 400tph crushing production line for Equatorial Guinea stone crushing and the 350 crushing production line for Zambia infrastructure construction are all supplied by Liming Heavy Industry. And each of these solutions was greatly approve by the customers. 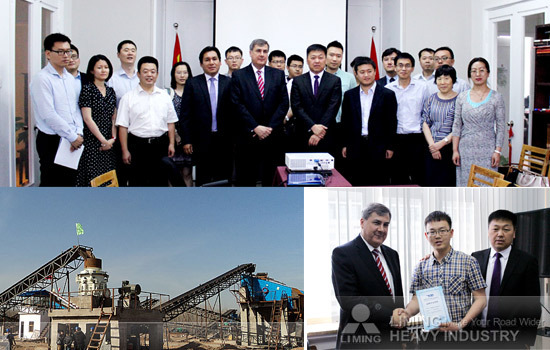 The Liming international trade representatives shown that we had the latest technology of crusher and grinding equipment, and we would expand cooperation space in overseas projects with our partners.